The first talk of the autumn programme was opened by Chairman, Tim Nichols, welcoming over 70 members to the talk by local lady, Cathie Welchman, entitled "Caring & Healing with Orchids". With the aid of digital technology she showed photographs to illustrate how to care and grow orchids. She discussed the history of their discovery and how they grow in their native countries. 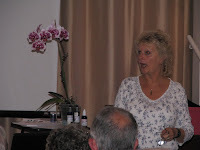 She went onto explain how the use of essences for healing and caring purposes was made and she passed examples of some essences around the audience for them to try. She explained what the colours and shapes of the plants meant and how plants help rid your aura of electro-magnetic pollution caused by cordless and mobile phones, computers and microwaves. After the slide show she talked on the practical aspects of growing orchids and explained the feeding and watering cycle.